If your project involves adding a permanent fixed stair or fixed ladder, installing a floor or lining walls/rafters then the works are considered to be a loft conversion and an application will be required, irrespective of the proposed use of the room. The key thing to consider is: if it looks like a room – it’s a room. Structural alterations to an existing roof such as removal of purlins or struts, as well as the installation of rooflights, requires a Building Regulations because the works are considered to be a structural or material alteration. However, you don’t need to put in an application if your project only involves the installation of power and/or lighting to the roof space as long as an electrician registered with a government-authorised competent persons’ scheme such as NAPIT or NICEIC carries out the work. Means of escape must be carefully considered, particularly where converting a loft to an existing house. This usually requires the provision of fire doors to protect the staircase and always requires the installation of a mains-wired fire alarm system. Where the staircase comes down into an open plan layout at ground floor it causes means of escape issues that may require an additional escape route or the provision of sprinklers. When looking at an alternative escape route ensure it is separated from the main staircase. When you propose a solution other than a fire-protected stair direct to an external door it is critical to seek early consultation with building control to discuss the proposed solution. 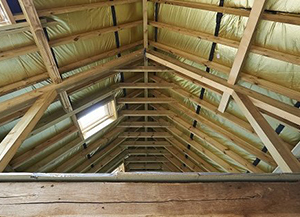 Note that installing boarding over your loft insulation will compress the insulation and seriously reduce its energy saving properties, so give consideration to prevent this issue arising. It is critical that there is enough headroom, and this may affect the viability of the project. Two metres are required above the stair and the landing: when calculating this, ensure you have allowed for the additional depth of floor joists and the lowering of the ceiling by additional insulation. You may need to make a separate application for planning permission. Contact your local planning office for advice if unsure.